Well the end is definitely in sight with my latest sampler quilt… with this week’s block I have enough blocks for my quilt top layout. So here is the last of my bright and grey blocks – The Zeppelin. All of the blocks in this quilt have come from the free Block Rockn’ paper pieced series by Julie at 627Handworks. You can find the Zeppelin and the other great patterns here. Julie has just released the last pattern in this series so there are 12 free patterns in total. You should check them out – they range from easy (like this one at just 20 pieces) to complex (her last block, Floyd, is fabulous but much more intricate with 80 pieces). Because of the size of this pattern you had to stick two pieces of paper together to make the foundation, but that was about as complex as this gets. This block fitted in nicely with the others I have done. Last night I pinned them up on my design wall, so I could start mocking up how to finish this top. I have a vision in my head how it all should look, I now just need to work out how to make my quilt top match my idea. I am hoping to get this top finished shortly – unlike my red/aqua top which is still sitting in a box waiting for me to decide what I want to do with it. I am desperate need of some sewing fairies… any one have some spare? I love the greys with those stars! Your blocks look awesome, can’t wait to see how to put them together! Beautiful! I love the colors. I can’t wait to see your finished quilt. Just love this block and they all look amazing together. It has been so much fun watching and waiting in anticipation for the next block. I have so enjoyed it Cath. I have no doubt you will have a WOW quilt with it. Thanks for sharing. I love the little bees peeking out! That is going to be a gorgeous quilt. You are making me reconsider making all of Julie’s blocks. I only have about 5 of them made so far and I was going to combine them with my skill builder blocks. I can’t wait to see your quilt top! I love sneaking novelty prints into my colour quilts, I just can’t help myself. It is a habit formed from the many many years of making only kids quilts. ahhh! love them so much! You should love them, Julie, they are your creations. My colors are all scattered, you have such a lovely color theme with the brights and grays, I wish I had thought of something like that. I need to remake quite a few blocks so they go together a little better. One of my favorite things about the paper piecing Monday samplers is picking the colour scheme. I am working on my next selection now. I am just in awe of how great a paper piecer you are. You give me hope! I just did my very first block today. The gray background on these blocks is fabulous and all those bright colours in the blocks make them look like gemstones! Sew-weet! Thanks for sharing! Love orange. 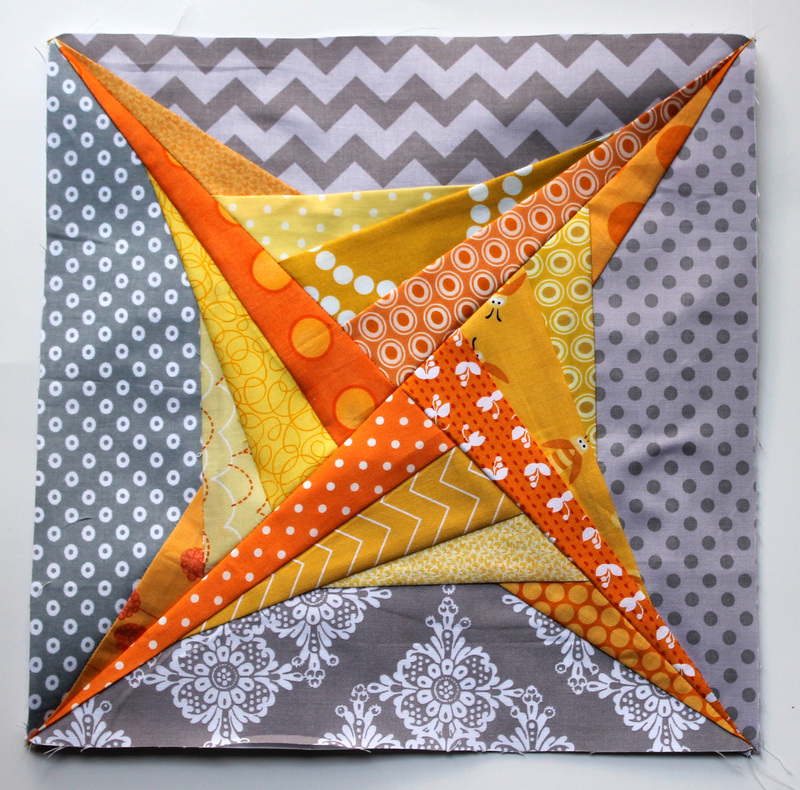 love grey, love stars – win win win on this awesome block. I adore your non-repeat colour choices in the orange and that you also choose different greys for each quadrant. Perfecto! It is the scrap quilter in me. I love playing with colour and pattern and lots of little bits of fabric is the perfect way to do it. I love it! I will definitely need to check that link out! Definitely do Mary Ann. The patterns are really fun and free. Got to love free! Ahhhhh I can’t even handle how pretty this is! I need to start my paper piecing project ASAP :). These are just so stunning! Will love to see how you set them. 627handworks blocks are incredible! I just love this one you did, Zeppelin. I made “Mercury” today and it had 56 pieces but was still EASY to make. Thanks for sharing! LOVE the colors- happiness! Great pattern! Promise to post the top as soon as it is done. Thanks. I can not wait to see how it all turns out. Pingback: Create An Autumn Blanket Coat! Make a Halloween Door Wreath! Piece a Pretty Spring Quarter Quilt! Sculpt Spooky Spool Place Card Holders! Print on Fabric Using the Freezer Paper Method! Paper Piece a Zeppelin Block! Papier-Mâché Candy Bowls! PLUS . . .